Music moves us mind body and soul. But did you know music can actually change our brains and enhance our lives? Resent research with children has shown that there is a direct correlation between listening to classical music, learning how to play an instrument and positive brain development. 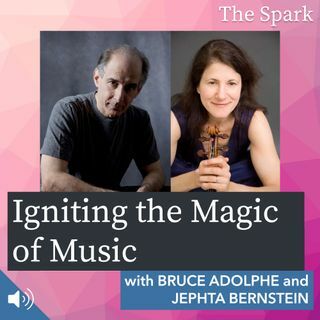 Violinist virtuoso Jephta Bernstein and international composer, musical scholar and author Bruce Adolphe illuminate our way into better understanding the amazing gifts that music holds for us. The ... See More magic of music; not just a delightful dance for our souls but the necessary fodder for our future brain development and a more fulfilling life for us all.